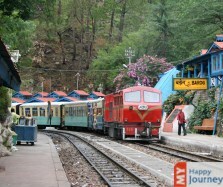 To be found in close approximation of Himachal Pradesh, at an attitude of about 1467 meters, is the renowned town Solan. Often it is regarded as the Mushroom City of India, because of the rich cultivation o f Mushrooms here. The town derived its name from the divine goddess Shoolini, who is worshiped here. Solan is surrounded by numerous gigantic peaks. You can see Matiul Peak on its east which is at a height of about 1,986 meters and on its north Karol Peak covers the region and is considered to be the highest range in the region with a height of about 2,000 meters. Due to its locality, the place is completely sheltered with dense forest, hills and can be reached via Kandaghat, Chandigarh, Kandaghat, Kasauli and Chail. During your trip to Solan you can see a huge influx of tourists who visit this place round the year but it has still managed to hold its significance, which lies in its diverse industrial sector. Some of the major companies which form a large part of the economy are Shivalik Bimetal Controls Ltd, Himalayan Pipe industries and the HFCL. For tourists who are more inclined towards religion and would like to discover its rich tradition and culture the town houses many attractions, such as the Jatoli Shiv Temple, the eminent Shoolini Mata Temple from which it derives its name, gurkha Fort and the Yungdrung Tibetan Monastery. This town can be visited any time of the year. One can take pleasure in its panoramic views and well maintained vegetation and roads that make your journey even more delightful.